PGM Graphics Solutions is a trading name for Pre-owned (Gallus) Machinery Ltd., UK. Our company was founded in 2005 by Claus Nielsen, based on over 20 years experience in the narrow web label industry, having worked 5 years with Nilpeter A/S, Denmark as international sales manager, and subsequently 13 years as managing director for Gallus-Group UK Ltd..
We operate on a global basis and specialise in buying and selling pre-owned Gallus and Arsoma label printing machines as well as other prime brands. In our view, -top quality brands of used machinery have much longer lifetime than normally anticipated, and most often there still remain many years of good service in such machinery, which still is capable to win awards. This gives many printers the opportunity to either up-grade, move into new market segments, increase capacity of same machine type or to acquire equipment for special applications. Even with used machinery it is possible to make technological progress. In periods with long lead times for new machinery it can be the solution for fast procurement of the required capacity thus avoiding the loss of valuable new business. Our general philosophy and policy is mainly to deal with pre-owned machines, which are proven to have been well maintained and which still run quality production. We ensure this is possible by primarily dealing directly with owners. Based on this fact most machines do not need refurbishing. However, if our clients wish to have machines refurbished for various reasons, we can offer this service through our co-operation with competent partners with special engineering workshop facilities. In October 20007 PGM Graphics Solutions became members of BUPMSA, British Used Printing Machinery Suppliers Association, ensuring our clients a recognised code of ethics and accepted trading standards. For further information, go to: www.bupmsa.org.uk . PGM been a member of FINAT as direct supplier since August 2008 and since September 2011 we became members of the new UK Labels association: BPIF Labels. In September 2011 we started a new business division: PGM Business Agents, offering our clients a contact and connecting platform for potential sellers and buyers of primarily label printing businesses. MATHO: Based near Stuttgart, Germany, Matho develops, designs and produces cutting units and waste extraction systems for labels, paper, carton, food, packaging, wood, textiles, non-woven and plastic industries. The machines exhaust, cut and transport your production waste into the waste disposal. Thanks to the modular structured concept, Matho is in a position to convert customer wishes to reality, immediately and with great flexibility. ATIQS has designed their own Booklet System “Bfeeder” and Plate Mounting system. The Booklet System can either be integrated into existing presses or we can design individual off-line solutions. Besides, PGM cooperates with ATIQS regarding refurbishment and special application machinery based primarily on pre-owned narrow web machines. 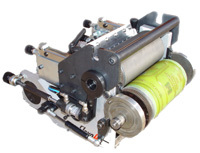 Chambered doctor blade systems for Gallus EM280 and EM410 flexo machines and FlexoCompact UV-flexo printing units for Gallus R160 and R200 label printing machines.